An underutilized site that was once a paved parking lot is being redesigned to have apartments, parks, and shops. 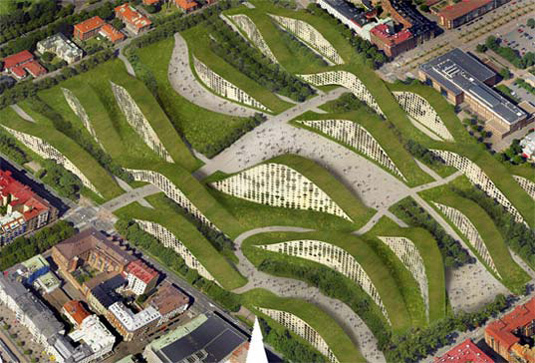 New Heden is a recent project that takes a vacant lot in Sweden and transforms it into a mixed-use, sustainable city. This project, by Kjellgren Kaminsky Architects, is in a way creating a city inside of a city. This underutilized site was once a paved parking lot and football fields but the redesign will have apartments, parks, and shops. New Heden has everything needed to create a walkable community. The new development will have five thousand new apartments that will house up to ten thousand people. There will also be sports facilities, newly designed parks, and small businesses. The hopes are that by providing all of these amenities and connecting them by bike paths and walkways will create a walkable community. 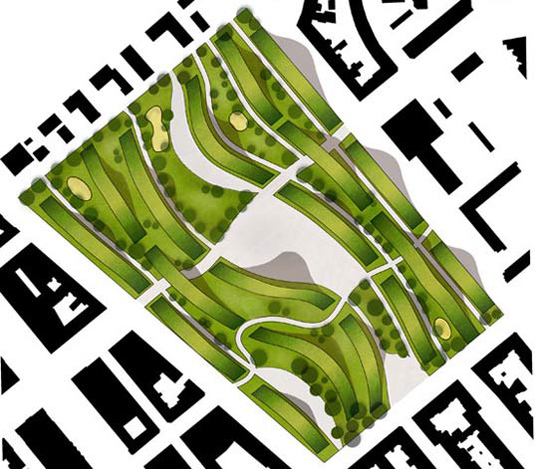 This plan should act as an example for the city of Gothenburg, Sweden and will hopefully revitalize the area and bring a greater appreciation to living green. The gently curving hills of New Heden are cut in section exposing the apartments and businesses located within. These hills are covered in grass and have walkways leading up them. From the top you can see views of the development while sitting in a park. The roof is also useful because it can collect and purify rain water to be used in the apartments.